A little bit tired of travelling we left Port McNeil and sailed down Johnstone Strait for 2 days and crossed Seymour Narrows back to Campbell River. After so much downwind sailing we had forgotten how hard it is to beat into the wind. 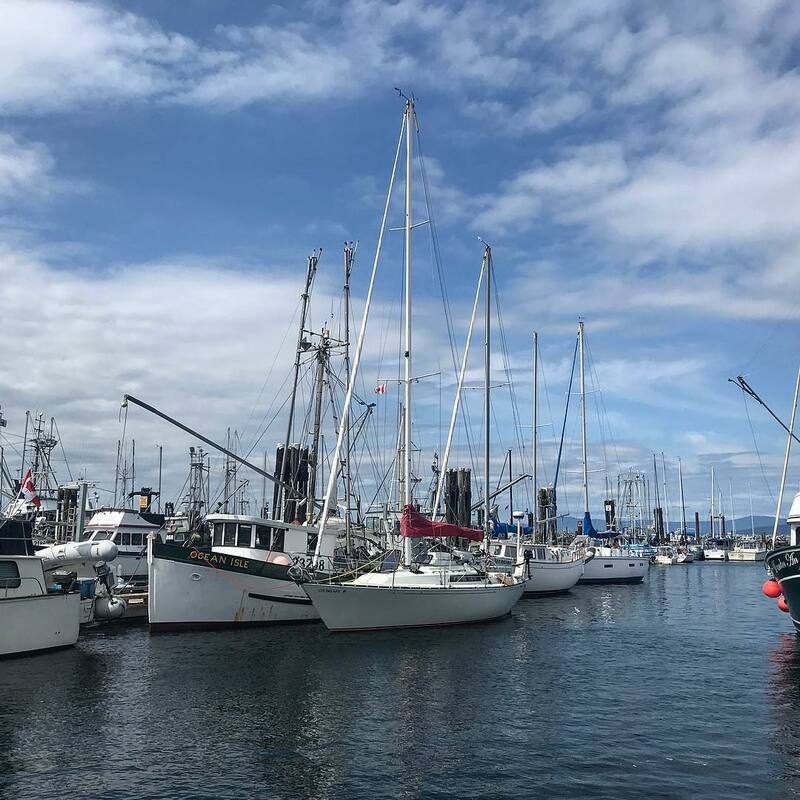 So we left Campbell River despite a forecast of southerly winds and promptly spend the day beating into nasty steep waves of Georgia Strait to reach Hornby Island by evening. The next days forecast was for even stronger southerly winds in the southern part of Georgia Strait. Our anchorage was not great so we left in the morning despite the forecast. By noon the winds had picked up to 20kts and we had a double reef in the main and were looking for options to bail. French Creek was the nearest harbor, protected by a breakwater it seemed to be our best option. Our last tack had gotten us close to it so we took down sails and started the motor. Our speed slowed to less than 3 kts and every wave seemed to bring us to a stop. At some point we noticed what seemed to be an overturned boat bouncing in the waves behind us. We decided to turn around to get a closer look. Bouncing up and down in the waves we could tell it was a small sailboat with a broken mast and the sail floating in the water next to it. The sea was still pretty rough so we could not get really close to it. We radioed the Canadian Coast Guard our position and they got back to us that everybody had been rescued and the boat was salvage and we were free to leave the scene. Relieved that we did not have to fish anyone out of the water we continued our excruciatingly slow journey through the steep waves to French Creek. The breakwater entrance was like a bad YouTube clip. The swells would pick us up and push forward with little ability to steer while we had to pass through a 50ft opening in a rock wall. After finally making it through we found the harbor so packed that most spaces were already rafted up two boats deep. We circled around for a bit and found a fishing boat that we rafted up to. Will probably stay here for 2 days until the wind turns north again :-).